I’ve mentioned selling our house a couple times on the blog, but today we officially put the for sale sign in the yard and suddenly it’s real! It’s very exciting, but a little nerve wracking at the same time since we don’t know where we’re going next yet! Minor detail, right? The thing is, I’m a planner. I like to know all of the details of an event well ahead of time so I can at least pretend to be prepared. The unknown is a bit anxiety inducing to me. The known is safe, expected. Luckily, there’s a reason opposites attract. My husband (Allen) handles the unknown quite well and almost prefers life to be spontaneous and unplanned. So the only thing left to do is stay optimistic and lean on him as we continue our house hunt in this seller’s market and maybe even have a little fun while we do so. After a long two months of dating, I moved into Allen’s house and we’ve been here ever since so we’ve never had the experience of getting a place together. That’s what I’m most excited about. It kind of feels like we’ll get to relive our newlywed days for just a moment. I’m picturing our new house waiting to become a home and us having takeout dinner and wine on a ‘box table’. It’s fun to daydream about, but first it’s back to keeping the current house extra clean, spending free time house hunting and exploring the option of building. And now I’m tired again 🙂 That’s when slow Sunday mornings with homemade breakfast become more appreciated than ever before. Egg casseroles are the best. You see them at every brunch, because they’re delicious and super simple to make. I love making them on Sundays, because leftovers means we have the luxury of a great breakfast on the work days without the prep and cook times. The other selling point is the ability to customize your casserole. Today’s had sausage (from our Farmers to Families order of course), shredded potatoes, green pepper, spinach and eggs. We’ve also made them with ham, bacon and different combinations of veggies. The potatoes are pretty consistent, but sometimes we get crazy and smash tater tots on the bottom instead of pouring in shredded potatoes! My Dad also came up with a great idea a couple years back. He always cooks a big Christmas breakfast and instead of cooking the egg casserole in a baking dish he now uses an oversized muffin pan to bake individual casseroles. It’s the perfect way to please a crowd of people with varying taste buds. For example, my sweet step daughter would probably only eat the version with ham/bacon and cheese. She’s not a fan of all the good toppings and still doesn’t believe me when I tell her she’s missing out. Allen on the other hand will eat anything and that statement is almost a little too literal! 🙂 It’s a bonus for me though when he even gladly eats my burnt dinners! Being a food blogger certainly doesn’t mean you get it right all the time. I’ve seen posts about failed recipes or kitchen mishaps and I have to admit I love them! It’s real life and the best thing you can do in life is learn to laugh more! Alright guys, back to realtor.com and the valentines day movie marathon on TBS. I can’t help but love these cheesy romantic comedies! Enjoy what’s left of your Sunday! Cook sausage in a small skillet over medium heat until no longer pink. Prep the green pepper and spinach and whisk the eggs, milk and seasoning while the sausage cooks. Heat the oven to 350. Grease a small baking dish (mine is a 10x7) with butter and add the shredded potatoes. Pour 2/3 of the egg mixture over the potatoes. Top with 1/4 cup shredded cheese, sausage and then remaining egg mixture. Sprinkle remaining cheese on top and cover loosely with foil. Bake for 40 minutes or until egg is set and cheese is melted. Allow to stand 5 to 10 minutes before cutting and serving. Garnish with green onions if desired. *I don't have measurements for the seasoning to add to the egg mixture. I used a combination of garlic powder, onion powder, himalayan salt, pepper and just a touch of smoked paprika. 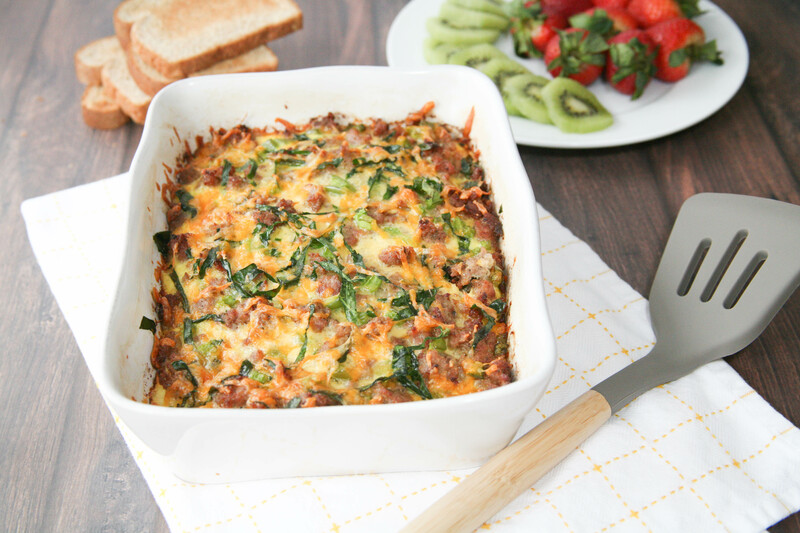 This entry was posted in Breakfast, Recipe Book and tagged breakfast casserole recipes, breakfast casseroles, brunch recipes, easy breakfast recipes, egg casserole, farmers to families, sausage and potato egg casserole, sunday brunch. Bookmark the permalink.